I’ve written about slime on a number of occasions. Just about every time Kaiya, Mylee, and Cole come for the day, slime happens. Dagny (who, by the way, turns 12 today) is a slime connoisseur as well. The purpose of slime rather eludes me. Play Doh I understand. I have seen my grandkids make amazingly intricate replicas of Play Doh food, or realistic-looking superheroes out of Play Doh. But slime? You just keep kneading it. Stress relief, according to Dagny and Kaiya. I’ve taken to doing what I guess many parents and/or grandparents are now doing, that being buying sparkly Elmer’s glitter glue in bulk, hoarding contact lens solution even though I wear glasses, and stocking up on plastic storage containers from the dollar store in which to store the slime. The popularity of slime, my friends, is an example of one of the most brilliant marketing strategies since Ray Kroc began hawking lukewarm hamburgers and a cheap plastic toy in cardboard boxes to kids and calling them Happy Meals. Elmer’s Glue must be making a veritable FORTUNE these days from kids making slime. It used to be that Elmer’s Glue’s success depended on parents and teachers buying tiny little bottles of glue to use to paste stars and half moons and suns onto construction paper. You have to sell a lot of little bottles of glue at fifty cents each to pay your CEO the big bucks. Now, however, Elmer’s Glue is sold in gallon bottles at twenty-five bucks a bottle. There is Elmer’s glitter glue and Elmer’s colored glue and Elmer’s glow-in-the-dark glue. 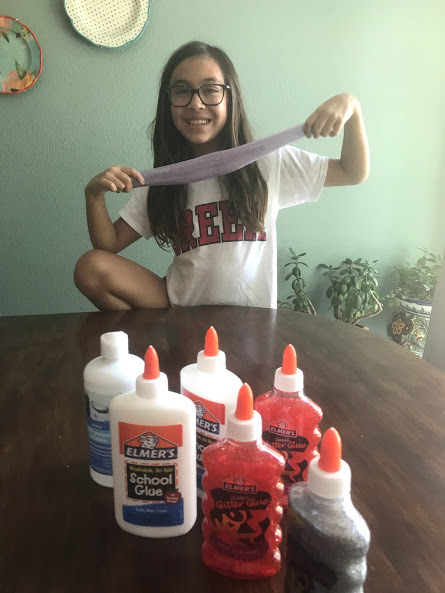 And every time one child in America makes a batch of slime, an entire bottle of one of these types of glue is used, making Mom or Dad or Nana go out and buy a new bottle (or two). So, there I am, once every couple of weeks, filling my grocery basket with the makings for slime. I stand in line behind other weary-looking patrons with carts full of glue and Borax or contact lens solution. In an effort to maintain some control, I actually have purchased special containers to hold my slime supplies. My house has a lingering smell of boric acid. Having said all of this, I will tell you that I have never understood why parents are so fed up with slime. It seems harmless, if also useless. Kaiya can make it in her sleep. Both Mylee and Cole feign interest, but they can’t even fake interest after about 10 minutes. Kaiya, on the other hand, will spend hours making it, and then stretching it and poking it pulling it and blowing bubbles in it and cracking and popping it. 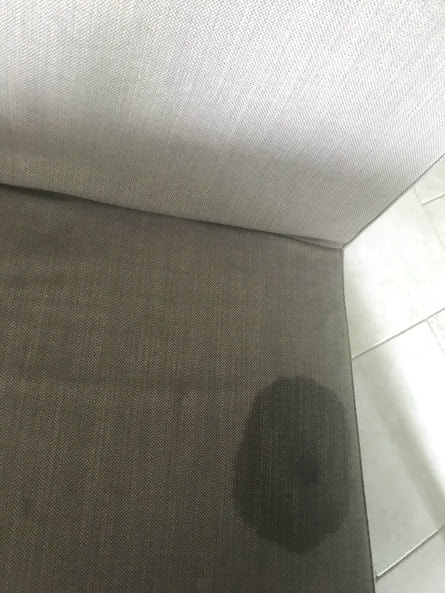 But what’s the harm in that?…..
Well, I was finally initiated into the I-Hate-Slime Club yesterday, when a tub of newly-made slime landed on my cloth kitchen chairs. Because you know what? Slime on upholstery doesn’t go away. It comes off of wooden and plastic tables and bowls and spoons. But slime on cloth — like diamonds — is forever…..
Bill did the best he could, but He-Who-Can-Get-Anything-Out-Of-Anything finally said, “Oh well, it think we can get new covers from IKEA….. I have a great idea for Elmer’s Glue. It’s time they start selling Elmer’s Foolproof Slime Remover For Fabric. Shrink-wrapped with Elmer’s Glue. Every year about this time, I begin seeing signs of the start of Girl Scout Cookie season. Cute little girls hawking their wares in front of the grocery store. What does that mean for me? 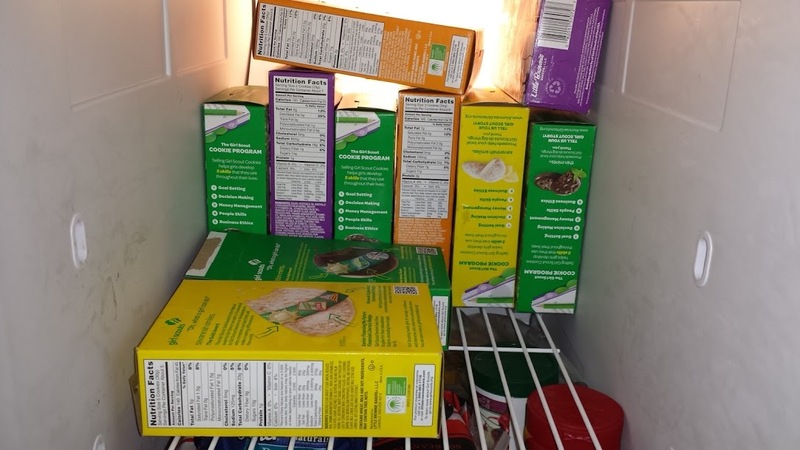 It means that given the fact that I have not one but two granddaughters who are Girl Scouts, very soon my freezer will be full of cookies. 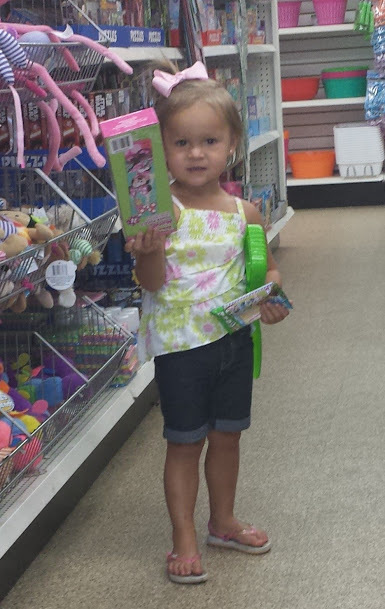 See last year…..
Kaiya’s sales pitch is very fancy, with her own cookie store web site (click here for cookies). I, of course, ordered four boxes of cookies from her web site. And then I emailed Jll and asked her if Maggie Faith had a Girl Scout cookie web site. “Nope,” Jll admitted, “but you can buy cookies by telling me and we will make sure you get them!” Old school, but effective. So very soon my freezer will look exactly like the photo from last year. I like many of the cookies, but I will tell you that the Savannah Smiles are totally addicting. Bet you can’t eat just one. Or at least I can’t. This past weekend I did some baking for my sister’s birthday. I realized it was the first time I’d baked since we arrived in AZ. I knew this because I had to drag my beloved Kitchen Aid mixer out of the garage. 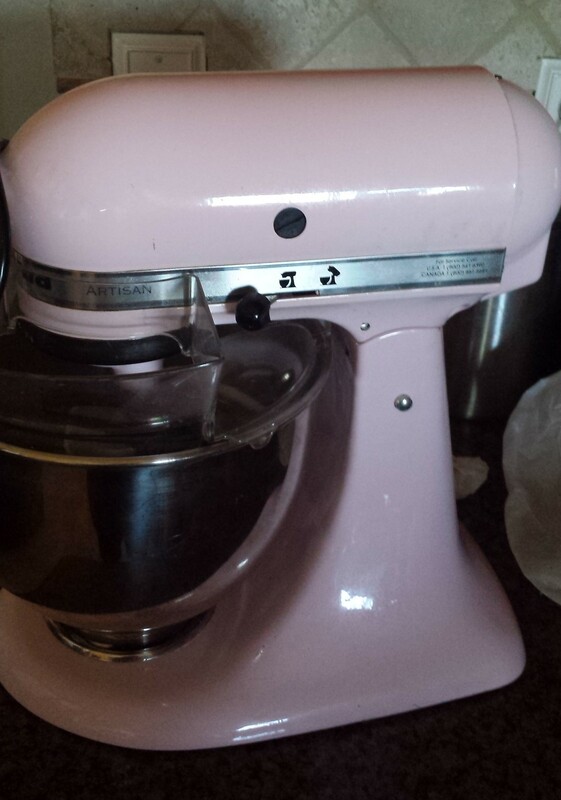 And, as usual, I had a start when I unwrapped it and saw the bright Pepto Bismol pink mixer. It works fine, and since I bought it off of Craig’s List, I didn’t have much choice about color. But the pink is quite pink. Paraphrasing Ralphie’s dad in A Christmas Story: “It looks like a pink nightmare.” The photo doesn’t do its pinkness justice…. January and February are the beginning of citrus season here in the Valley of the Sun. So at church last Sunday, a number of people had dropped off bags of lemons – the citrus fruit currently being harvested. The church allows them to bring the fruit and invites other parishioners to take them home. And I did so happily. 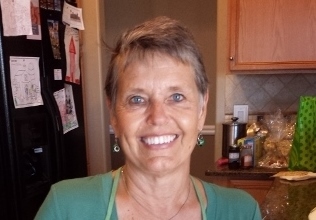 So this week we’ve had lemon shrimp, many Caesar salads, and Barefoot Contessa’s lemon chicken. 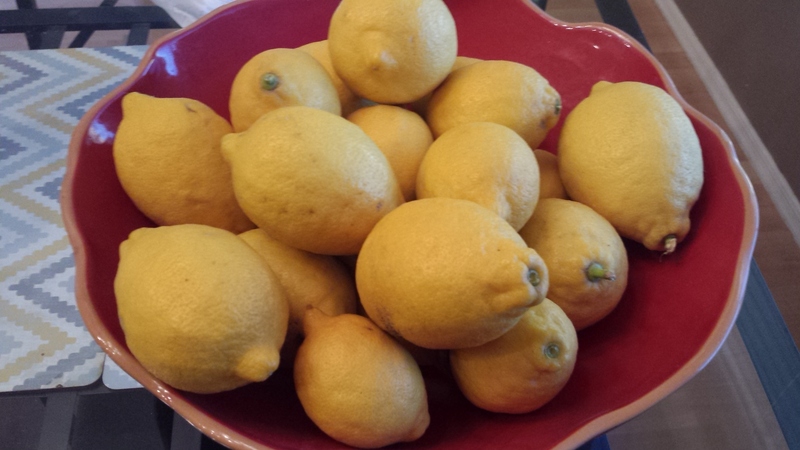 I love lemons, and these are so juicy and delicious. I will get more next Sunday if I can, because, well, I can…..
Lilly, NOT knocking over a table of pho.